As Dean of the Central States Deanery, part of Fr. Roman’s duties is to visit all his parishes at least once a year. Before the bad winter weather settles in, Fr. Roman was been trying to complete his parish visitations during the month of November, 2014, visiting his St. Nicholas Parish in Brookside (Birmingham), Alabama (November 1st & 2nd); the Nativity of Christ Parish in Youngstown, Ohio (November 22nd & 23rd); and on Friday and Saturday, November 28th and 29th he visited our St. John Chrysostom Parish in Grand Rapids, MI, where the Pastor, Fr. James Anthony, had asked Fr. ROman to give a presentation about the meaning of the Nativity Fast on Friday evening after Vespers. Then on Saturday morning, Fr. Roman, the Pastor, and other Deanery clergy concelebrated Divine Liturgy, after which the clergy and their wives enjoyed a luncheon with the parishioners. Fr. Roman has done a great deal for all 3 of these parishes, for which they are very appreciative. Here is a nice photo of Fr. 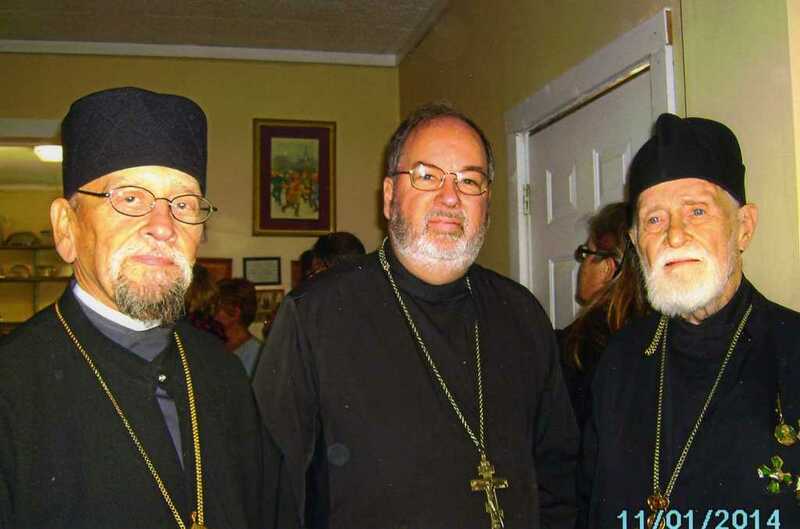 Roman with the 2 priests at St. Nicholas Church in Brookside, Alabama: on the right is the 87-year-old Pastor, Rt. Rev. Mitered Archpriest Fr. Benedict Tallant, and in the center is the fairly recently-ordained priest and new Assistant Pastor, Fr. Paul Davis. Fr. Paul had served the parish as a Deacon for many years, and was ordained priest in order to assist the pastor, who happens to be his father-in-law, and to help maintain the life of the small parish. Fr. Roman scheduled his visitation to coincide with the parish’s big Annual Russian Festival, which was very successful.